The four ultra-luxurious sea facing Suites exist to entice and excite. Distinguishing features include living orchids rather than cut flowers; unique spa-quality Gilchrest & Holmes toiletries from England, Air conditioners, Internet access, en-suite bathrooms with Jacuzzi baths and separate showers, Satellite Flat Screen Televisions, Snack Platters, Welcome High Teas, Mini Bars, Private safe, Same day complimentary laundry service, Percale cotton linen, Bathrobes, Slippers and Hairdryers. 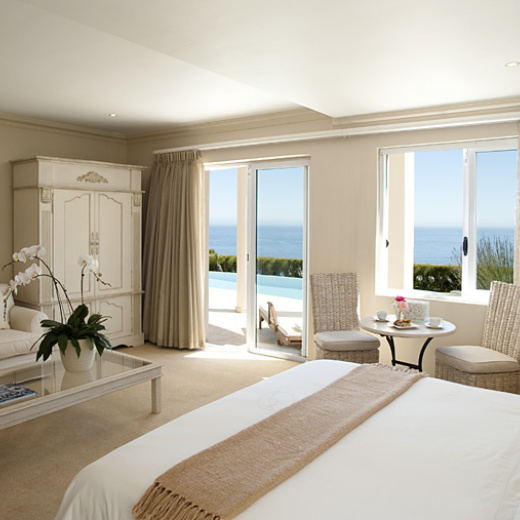 The spacious sea facing, luxury Suites sleep two in XL King beds. Private lounge areas, leading onto the wrap-around patios, overlook the uniquely large solar heated infinity swimming pool and Camps Bay’s unsurpassed sunsets. A breathtakingly beautiful beach and convenient location (just ten minutes from Cape Town’s City Centre and 25 minutes from the International Airport), Camps Bay is one of Cape Town’s most desirable Real Estate areas for vacation homes and luxury residences.